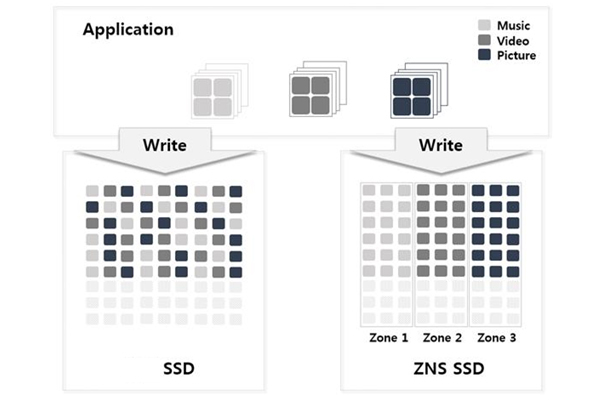 The ZNS (Zoned Namespaces) SSD solution set up as a standard for next-generation enterprise SSD was demonstrated for the first time in the world at the 2019 OCP Global Summit held in San Jose, CA, its creator SK Hynix Inc. said on Monday. The solution is run by ZNS SSD software independently developed Korea’s No. 2 chipmaker. SK Hynix said the new ZNS SSD marks a 30 percent improvement in speed and reliability and a four-fold shelf life versus the existing SSD, making it ideal for next-generation data centers. ZNS refers to a technical proposal for data management by big global data centers to improve server and storage efficiency. The existing SSD stores photo, video and music data in the same place despise their different purposes, but the ZNS SSD can group data depending on their purpose or usage frequency for storage in separate zones inside the SSD to ensure improvement in data management. This can be likened to the operation of separate railroads for an express train and an all-stop train to remove bottlenecks and deliver faster and better outcomes, the company said. SK Hynix aims to complete the development of the ZNS SSD this year and release a commercial version in the first half of next year. The company said it is cooperating with key global data center customers in the development of various memory solutions and ZNS SSD is one of them. The Open Compute Project (OCP) is a rapidly growing community of engineers around the world whose mission is to design and enable the delivery of the most efficient server, storage and data center hardware designs. The event led by the OCP attracted some 3,600 participants from the industry and university sectors.